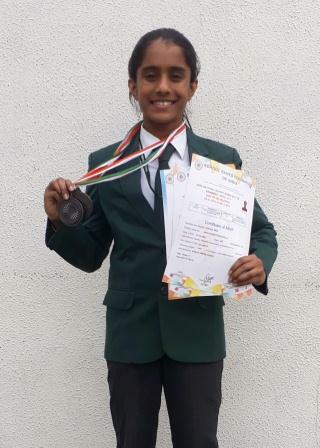 Arushi Shivakumar of class IX-D participated in the 64th National School Games Swimming Championship which was held in Delhi from 14th December 2018 to 19th December 2018. She participated in three events and won a Bronze Medal in the 200mt Butterfly event under-17 girls category. Student of class 12 B participated in the state level SGFI Swimming tournament and won a Gold medal in 50m Butterfly , Gold medal in 100m Butterfly and Silver medal in 50m Freestyle events which was held at Swami Vivekananda Swimming Pool Khokra , Maninagar , Ahmedabad on 29th November,2018 and he has qualified for SGFI NATIONALS. (1) Participated in the 6th Gujarat State Junior Badminton Championship held at JUNAGADH, Gujarat from 21st – 25th August 2018. In the singles category U- 19 she got third position – i.e Bronze Medal and in the same tournament in the U -19 category in doubles she was 2nd i.e Silver medalist. (2) Participated in the 5th Gujarat State Badminton championship held at Bhavnagar, Gujarat from 8th August to 12th August 2018 and became champion in the U-17 Doubles Category. She is also going to represent Gujarat in the national level championship U- 25 category going to be held in Trivandrum, Kerala from 18th September to 22nd September 2018. 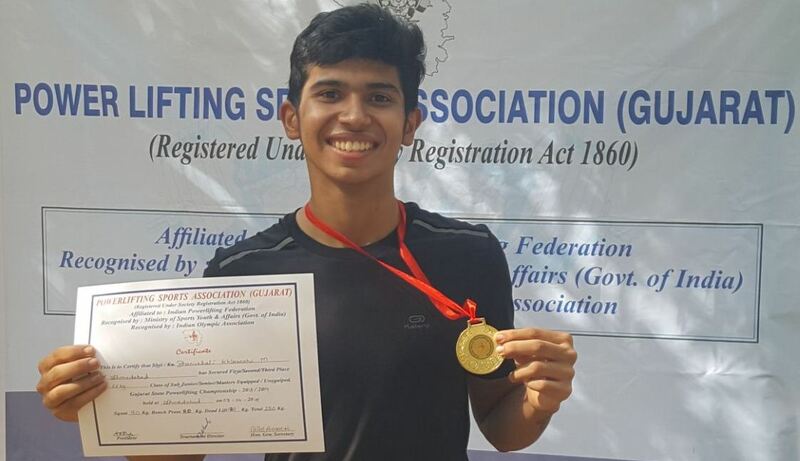 Jay Tandon of class 12E had participated in U-19 SGFI Ahmedabad Rural Lawn Tennis tournament held on 3rd August in Khokhra sports complex Maninagar and has secured 2nd position. Happy and Proud to Share that Khiranshu won First Place in Gujarat State Power Lifting Championship 2018-19 for sub – juniors, below 17 years, in 60-66 kgs category. His score is Squat 70Kgs., Bench Press 60 Kgs., and Dead Lift 120 Kgs. Total 250 Kgs. The Event was organized by POWER LIFTING SPORTS ASSOCIATION (GUJARAT) for State Level. Khiranshu shall participate in National Level in May 2018 at Andhra Pradesh. Student of Delhi Public School - Bopal, Ahmedabad, Arushi Shiv Kumar of class 8-F, participated SGFI National Level Swimming Championship held at Delhi from 25-11-17 to 29-11-17 and achieved 2 Bronze medals in 200 mts (Butterfly) and 4X100 (Medley relay).